A spiral galaxy is a kind of galaxy that looks like a flat, slowly rotating disk with a bulge in the centre. It contains stars, gas, dust, dark matter and a supermassive black hole at its centre. Galaxies were first listed in the 18th century by William Herschel. 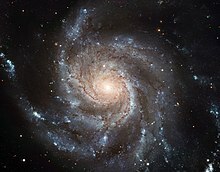 The spiral galaxy as a type was first described by Edwin Hubble in his 1936 work The Realm of the Nebulae. They are named after their shape. The spiral arms are where young, hot stars are made, which is why they are brighter than the center of the galaxy. Some spiral galaxies have yellow, 'fossil' arms of older stars. The barred spiral galaxy is an important and common type of spiral galaxy. There are three other kinds of spiral galaxies. Grand-design spiral galaxies have two well-shaped arms. Multiple-arm spiral galaxies have more arms. In flocculent spiral galaxies, it is hard to see the arms at all. About 60% of galaxies in the universe near us (the 'local universe') are spiral and irregular galaxies. They are mostly found in low-density parts of the universe, and are rare in the centers of galaxy clusters. Our own Milky Way has recently (in the 1990s) been confirmed to be a barred spiral galaxy, although the bar itself is difficult to observe from our position in the Galactic disk. The most convincing evidence for its existence comes from a recent survey, performed by the Spitzer Space Telescope, of stars in the Galactic center. ↑ 'Supermassive' means not just large size, but huge gravitational effect. ↑ Hubble, E.P. (1936). The Realm of the Nebulae. New Haven: Yale University Press. ISBN 0300025009. ↑ 3.0 3.1 Benjamin, R. A. et al. ; Churchwell, E.; Babler, B. L.; Indebetouw, R.; Meade, M. R.; Whitney, B. A.; Watson, C.; Wolfire, M. G. et al. (September 2005). "First GLIMPSE Results on the Stellar Structure of the Galaxy.". The Astrophysical Journal Letters 630 (2): L149–L152. doi:10.1086/491785. http://www.journals.uchicago.edu/doi/full/10.1086/491785. Retrieved 2007-09-21. ↑ "BBC - Science & Nature - Space - Galaxy Guide". bbc.co.uk. Retrieved 2 October 2010. ↑ "Spiral galaxies". burro.cwru.edu. Retrieved 2 October 2010. ↑ Loveday, J. (February 1996). "The APM Bright Galaxy Catalogue.". Monthly Notices of the Royal Astronomical Society 278 (4): 1025–1048. http://articles.adsabs.harvard.edu/full/1996MNRAS.278.1025L. Retrieved 2007-09-15. ↑ Galaxies are not spread randomly in the universe. ↑ Dressler, A. (March 1980). accessdate= 2007-09-15 "Galaxy morphology in rich clusters — Implications for the formation and evolution of galaxies.". The Astrophysical Journal 236: 351–365. doi:10.1086/157753. http://articles.adsabs.harvard.edu/full/1980ApJ...236..351D accessdate= 2007-09-15. This page was last changed on 11 March 2013, at 22:55.